I am an Amazon Prime member and have been one for a long time, and I am completely hooked. Not only do I (and my family) use Amazon Prime for items ranging from tissue paper to big screen televisions, but it has become my go-to for every possession that I need in my working and personal life. In fact, I know (and am completely at peace with the fact) that it has subtly affected my buying, as I substitute slightly more expensive Prime items for non-Prime equivalents, even when I shop on Amazon. It is not just the absence of shipping costs that draws me to Prime, but the reliability of delivery and the ease of return. In short, it makes shopping painless. As I tally how much we save each year because of Prime and weigh it against the $99 that we pay for it, I am convinced that we are getting far more value from it than what we pay, and that leads to an interesting follow up. 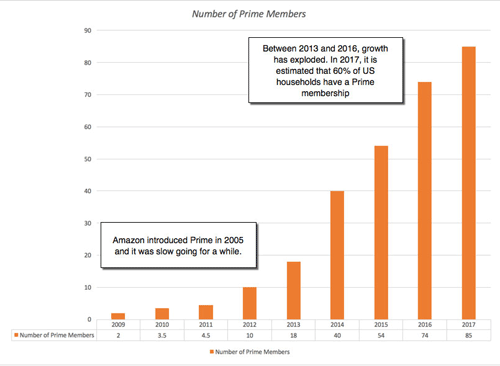 If many of the 85 million other Prime members in October 2017 are getting the same bargain that we are, is this not an indication that Amazon has not just under priced Prime, but is perhaps selling it below cost? As someone who has wrestled with valuing Amazon (NASDAQ:AMZN) over the last 20 years, I have learned never to under estimate the company. In this post, I would like to take the process I used to value a user at Uber and apply it to value not just a Prime member to Amazon but the collective value of Amazon Prime to the company. Operating Margins on revenues: To estimate the operating margin on revenues, I started with Amazon’s operating margin but then added back the shipping, customer service and Prime media acquisition costs, since I treat them as separate costs. The resulting margin is 12.11%. I have long described Amazon as a Field of Dreams company, one that goes for higher revenues first and then thinks about ways of converting those revenues into profits; if you build it, they will come. In coining this description, I am not being derisive but arguing that the market’s willingness to be patient with the company is largely a the result of the consistency with Jeff Bezos has told the same story for the company, since 1997, and acted in accordance with it. 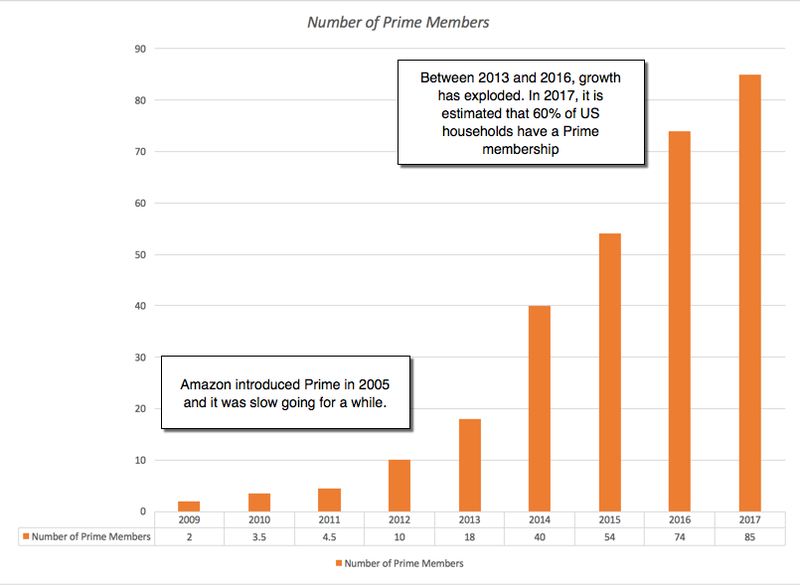 Amazon Prime symbolizes how Amazon plays the long game, an investment that has taken a decade to bear fruit, but one that will be the foundation on which Amazon launches into new businesses. I know that there are many companies that model themselves after Amazon, but unless these “Amazon Wannabes” can match its narrative consistency and long time horizon, it will remain a one of a kind. Update: One of the things that I enjoy most about posting my valuations online is the feedback and how much I can use that feedback loop to improve my valuation. There are three changes that I have made to my Amazon valuation, though the end number that I get is not that different. First, as many Prime members outside the US have pointed out, the cost of Amazon Prime is less than $99/year in many countries, ranging from $22/year in Italy to just over $50/year in Germany to only $8/year in India. That lower annual cost will bring down the value of a member (existing and new). To allow for that, I have replaced the $99 annual fee that I had used in my valuation with $93.78, a weighted average of the fees, allowing for the one quarter of Prime customers in the US who have monthly subscriptions (and pay more) and the 20% of customers outside the US (my estimate), who pay, on average, about $50/year. Second, as some of you have noted, my operating margin was computed prior to just shipping costs and that I am double counting the customer service and media costs, which should also be added back. That increases my operating margin to 12.11% from 9.19% and I will assume that it improves to 13% over time. Third, and this was entirely my mistake, my value per existing member did not factor in the drop out rate and that has been fixed. Aswath Damodaran is a Professor of Finance at the Stern School of Business at New York University. He teaches the corporate finance and valuation courses in the MBA program as well as occasional short-term classes around the world on both topics. Professor Damodaran received his MBA and Ph.D degrees from the University of California at Los Angeles. His research interests lie in valuation, portfolio management and applied corporate finance. He has written four books on equity valuation (Damodaran on Valuation, Investment Valuation, The Dark Side of Valuation, The Little Book of Valuation) and two on corporate finance (Corporate Finance: Theory and Practice, Applied Corporate Finance: A User’s Manual). He also co-edited a book on investment management with Peter Bernstein (Investment Management) and has two books on portfolio management - one on investment philosophies (Investment Philosophies) and one titled Investment Fables. He also has a book, titled Strategic Risk Taking, which is an exploration of how we think about risk and the implications for risk management.